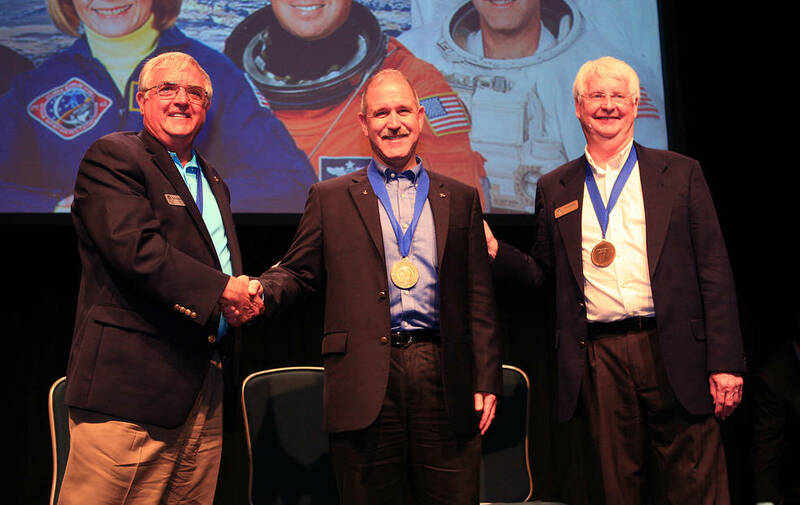 NASA Associate Administrator for the Science Mission Directorate and astronaut John Grunsfeld (center) is inducted into the U.S. Astronaut Hall of Fame on May 30, 2015 at the NASA Kennedy Space Center Visitor Complex in Florida. Shaking Grunsfeld’s hand is Dan Brandenstein, Chairman of the board of directors for the Astronaut Scholarship Foundation, and standing next to Grunsfeld is former NASA astronaut Steve Hawley. May 30, 3015 – NASA’s Associate Administrator for the Science Mission Directorate John Grunsfeld and former astronauts Steve Lindsey, Kent Rominger, and M. Rhea Seddon were inducted into the U.S. Astronaut Hall of Fame Saturday, bringing the total number of Hall of Fame space explorers to 91. NASA Administrator Charles Bolden, a 2006 hall of famer, and 2008 inductee Bob Cabana, director of NASA’s Kennedy Space Center in Florida, presided over the ceremony at Kennedy’s visitor complex to welcome the new inductees. Grunsfeld was selected as a NASA astronaut in March 1992. A five-flight veteran, he logged more than 58 days in space, including 58 hours and 30 minutes of extravehicular activity during eight spacewalks. Three of his missions focused on repairing and upgrading NASA’s Hubble Space Telescope. He went on to serve as the deputy director of the Space Telescope Science Institute in Baltimore, managing the science programs for Hubble and the James Webb Space Telescope, scheduled for launch in October 2018. Grunsfeld was selected in January 2012 to his current position at NASA Headquarters in Washington. Lindsey was selected for NASA’s astronaut corps in March 1995. A veteran of five spaceflights, he logged more than 63 days in space. Lindsey served on several notable missions, including STS-95 alongside former astronaut and U.S. senator John Glenn, STS-121, the second Return to Flight mission after the loss of space shuttle Columbia, and STS-133, the final flight of space shuttle Discovery. NASA selected Rominger to become an astronaut in 1992. Also a veteran of five spaceflights – three as pilot and two as commander – he logged more than 67 days in space. Several of Rominger’s missions were integral to the beginnings of the International Space Station. As commander of the STS-96 mission, Rominger oversaw the first docking of a space shuttle to the station. Seddon was selected by NASA in January 1978 to the first U.S. astronaut class to include women, and became an astronaut in August 1979. A three-flight veteran, she logged more than 30 days in space. In addition to participating in and leading numerous science and medical experiments during her flights, Seddon also helped develop and implement a variety of programs and plans for the shuttle program.